Morocco is located in North Africa, separated from Europe by the Gibraltar Strait. 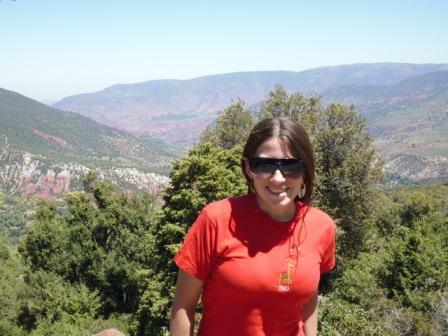 The Atlas mountain range is a mountainous system that runs, along 2400 km, northwest of Africa, being to the south-east of Morocco and dividing the landscapes into 2 very different. 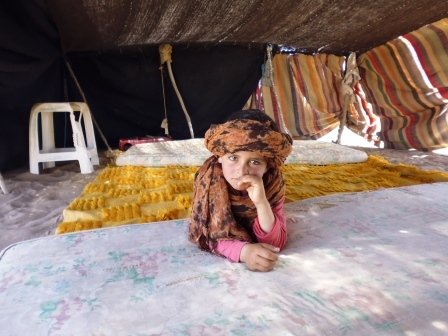 The Atlas population is mostly Berber, a nomadic people tribe. The Atlas separates the coasts of the Mediterranean Sea from the Atlantic Ocean of the Sahara Desert, being one of the factors that cause the dryness of this desert. Summarize my experience in Morocco in a few words is really difficult because this country is rich in culture, different landscapes and adventures. As you can imagine there is a great variety of activities to do and places to go. 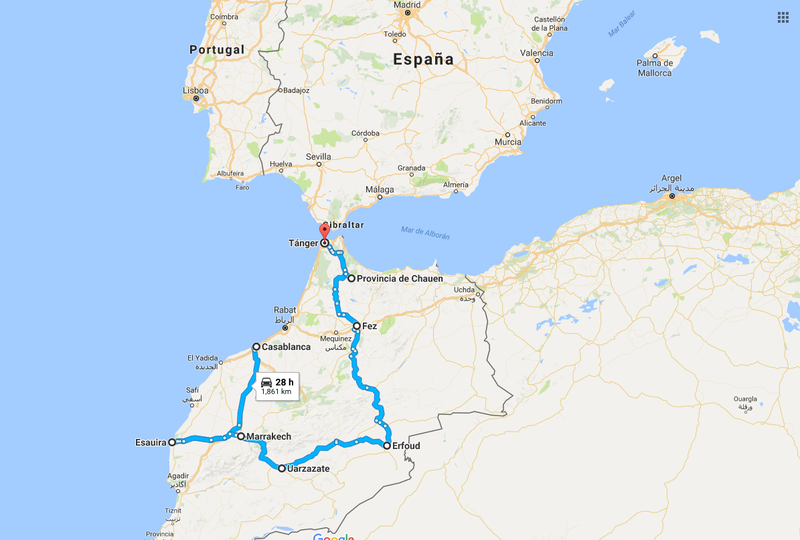 In this post I will tell you what to do in Morocco, telling you about the roadtrip I made in this fantastic country, a unique experience that I highly recommend. I share the log of my trip. I recommend that you put the cursor on the photos for more information. Casablanca, is a city which is located on the coast of the Atlantic Ocean, 80 km south from Rabat, and it is the administrative capital. 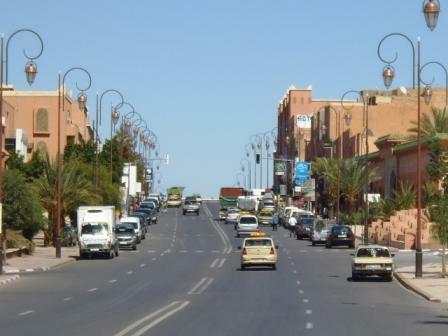 It is considered the economic and commercial center of Morocco, while the political capital is the city of Rabat. 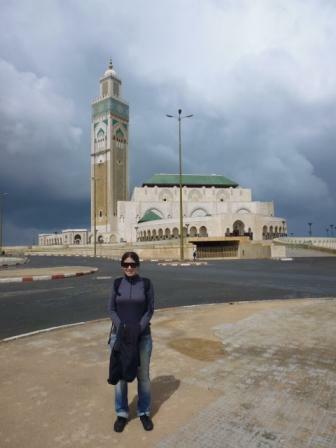 Motivated to know the place where the movie Casablanca was filmed, I did not hesitate to include it in my itinerary. 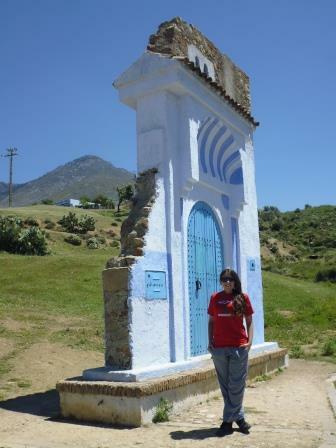 This was the first city in Morocco where I went, after my visit my cousin in Switzerland. The cultural shock was very great, I must admit, maybe that was one of the things that most captivated me. 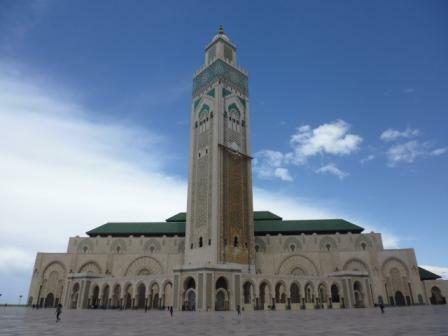 According to a Hassan II Mosque tour guide, in order to attract tourism King Hassan II, in 1993 he inaugurated the Hassan II Mosque (after 8 years of construction). At that time Hassan II Mosque was the highest temple in the world (the lasers Of the 200 m minaret can be seen from several kilometers), and the second largest (after the Mecca mosque). 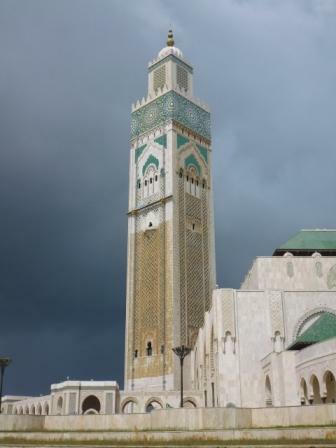 According to other sources, the designation of Casablanca as the city in which that Mosque would be constructed, this location was choosen by King Hassan II because he considered that the capital of the economic power should have an emblem that distinguished it over the other populations of the country. In this city was where I started one of the best roadtrips I did in my life! 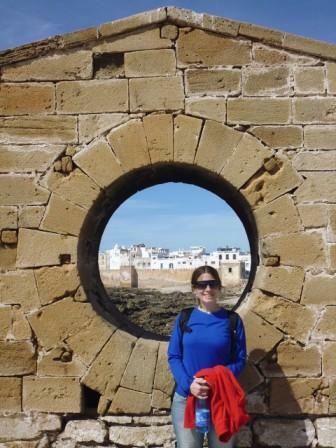 I left Casablanca early in the morning, so I arrived in Essaouira shortly after noon (little more than 5 hours in car approximately). The trip and the scenery really were amazing. 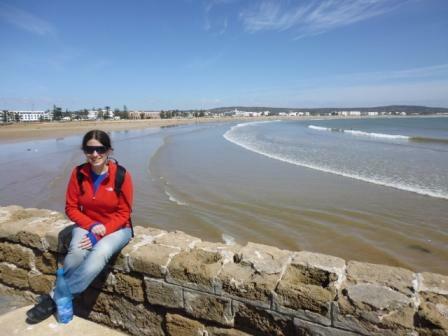 Essaouira is a beach town to which many Moroccans go on vacation. Its historical center or medina was classified by Unesco as Patrimony of the Humanity in 2001. 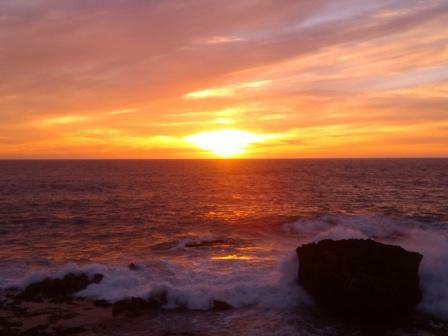 The sunset at Skala de la Ville is one of the most beautiful in the world. 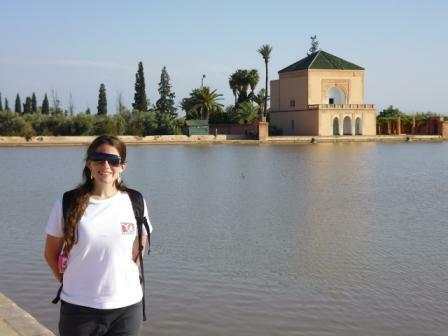 I left Essaouira early in the morning and after a little over 3 hours, I arrived in Marrakech. 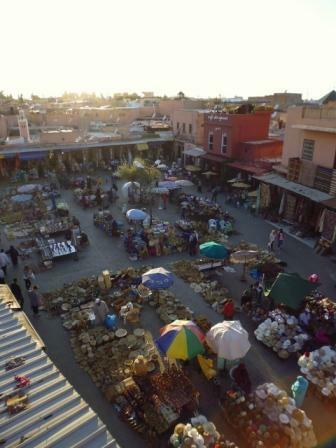 Marrakech is one of the most important cities in Morocco and has numerous monuments of World Heritage. 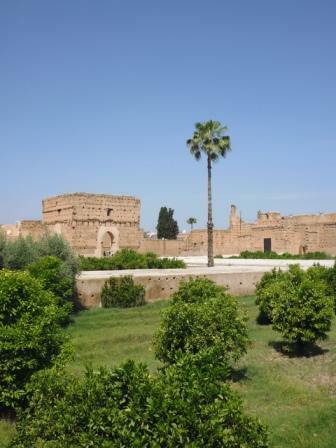 It is one of the four imperial cities of Morocco with Meknes, Fez and Rabat. It was founded in 1062 and has been being the capital of the Islamic empire. 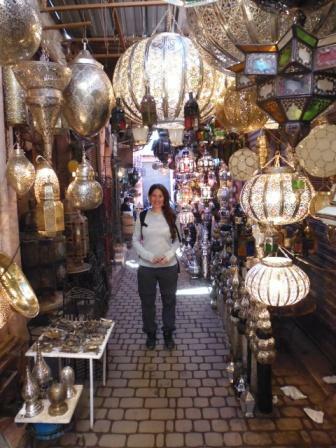 Typical markets, called souks, have a great variety of products as beautiful lamps, carpets, spices, etc that when I saw them I gasped. The city is incredibly beautiful and has the largest souk in the country (shown in the photos above) and one of the busiest places in Africa and the world Djemaa el Fna that is worth visiting both during the day and is a must visit at Night. During the day you can see acrobats, vendors, dancers and musicians. During the night Djemaa el Fna is full of food stalls being a large open air restaurant that is filled with locals and foreigners, being a unique show. 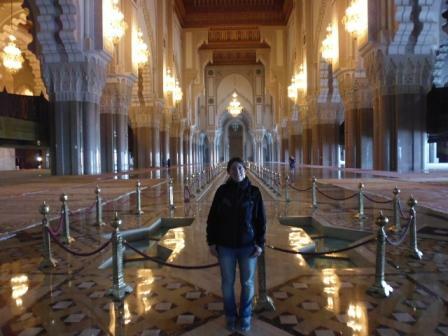 In Marrakech I spent 2 days visiting mosques, the medina and countless incredible historical monuments. 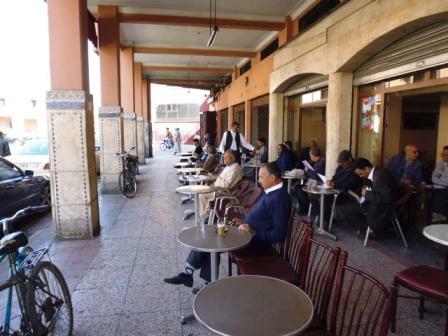 In traditional bars, it is designed that only men (except tourists in tourist areas) who sit all facing the street. Another really amazing place to visit is the Badi Palace. It is the most famous palace in the city. It was built between 1578 and 1602 and was considered one of the most beautiful palaces in the world, so it gained the name of “The Incomparable”. Today, the ruins of a palace that is resplendent to those who had the luck to live in it or to be the guests. 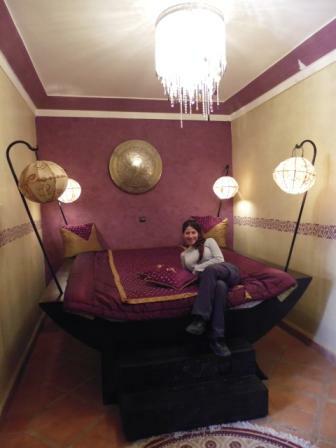 I stayed outside the medina, but really close it, in an amazing riad. 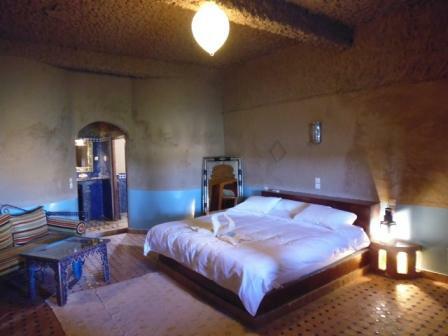 The amazing thing about Marrakech is that you have the option of staying in historical places such as the medina or in completely modern places like it is in modern Marrakech. 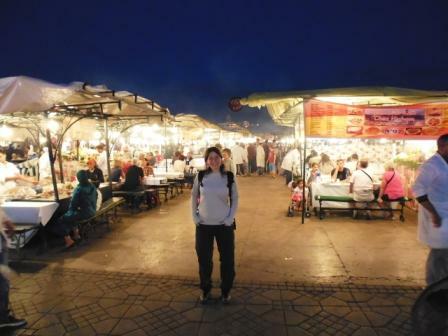 Mix with the crowd in Djemaa el Fna, from the afternoon and finish dining at the stands. It is difficult to choose the most beauty routes, but I would play that this was one of the roads that I liked most of all. It is incredible the change of landscape from Marrakech to the north of the Atlas to Ouarzazarte (called the gate to the desert), being at first very green ending in the Sahara desert passing through unique geographical features that made the trip take me the full day because I used to venture into the landscapes of the road. The trip from Marrakech to Ouarzazate took me about 4 hours. I left Marrakech early in the morning with the intention of arriving near noon to be able to know a little this tourist city and the film industry that is very important in it. Here are the most important film studios in Morocco, called the Atlas Studios, where well-known international producers work. 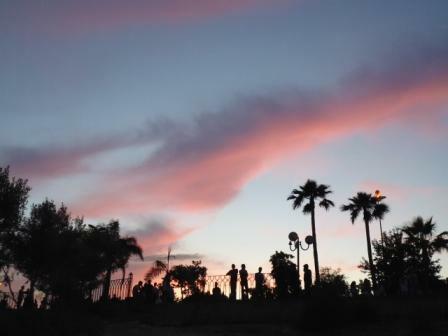 In the neighborhoods have been filmed numerous movies like Asterix and Cleopatra, Lawrence of Arabia, Star Wars, Gladiator, The mummy, The last temptation of Christ, The living dawn, Crusade, etc. 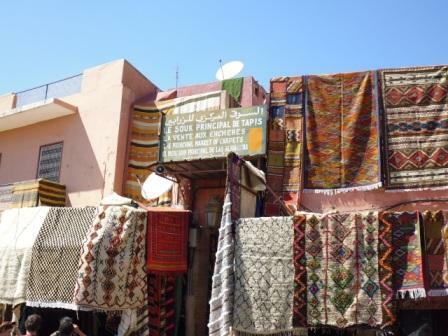 These studios are the largest in the world and are only 5 km from Ouarzazarte. 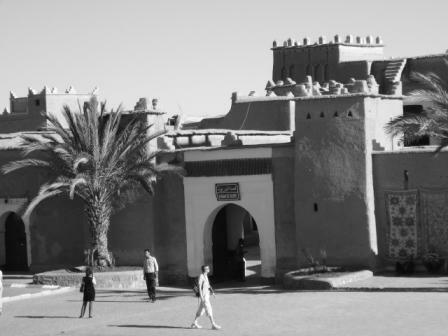 When I arrived in Ouarzazate the good taste in the building and in everything I found exquisite. 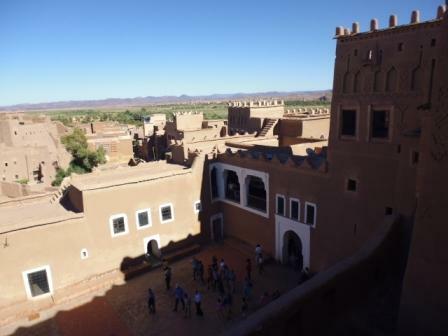 Taking advantage of the existence of these cinematographic studies, the great beauty of its landscape and its buildings, Ouarzazate is the scene of various events related to the world of cinema and other cultural festivities. 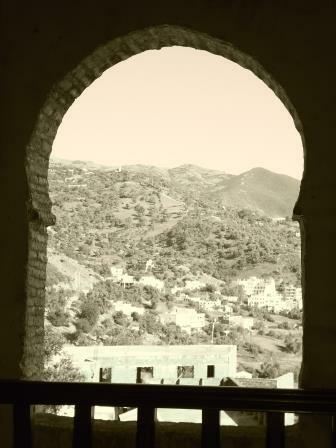 In this city you can also visit the Kasbah of Taourirt, which is an amazing kasbah. After the trip and visiting this beauty city I decided to drink a mate and enjoy the pool. 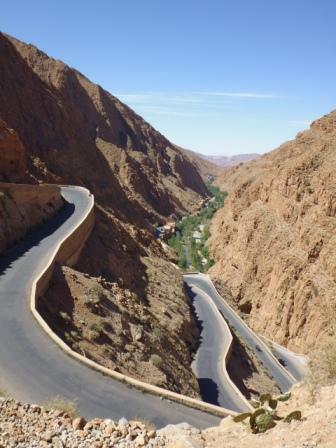 On the road from Ouarzazate to Erfoud, I passed the Dades gorges. If you go directly without stopping in the intermediate villages the trip takes about 5 hours, but with an incredible landscape it was impossible to me to to continue without stopping to enjoy it, so foreseeing this, I left very early in the morning. I passed through different very traditional intermediate villages. At one point I stopped at an intermediate point in which I saw a postcard worthy of being photographed, it was women dressed in traditional costumes, covered and in the background a spectacular landscape was seen, when I was positioning myself to take the photo, I saw women they ran and started throwing things at me to get me out and did not take photos. There I learned, that at least in this country, you must ask permission if you want to photograph a person with some background landscape. Later, I saw similar situation other turists even taking photos to face pictures in a medina. 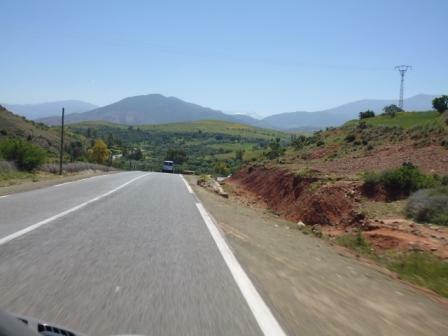 In the tour passed several motorcycle rides, it is a typical route to do in motorcycle and highly recommended. 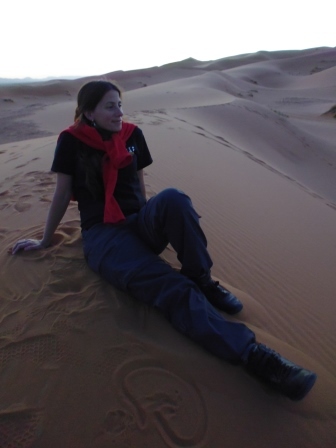 I must admit that when I arrived in the Sahara Desert I was so moved! 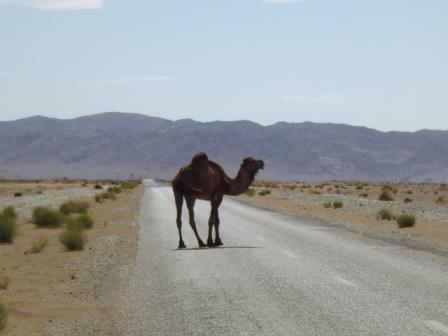 I could not believe I was in the middle of the desert and saw the dromedaries loose at the sides of the road. It was amazing! I remember that I had agreed via mail to meet with who was to be my guide for the excursion in the desert in a corner of the city of Erfoud that day at 17 hours, reason why I could not stop too much time in the intermediate towns. 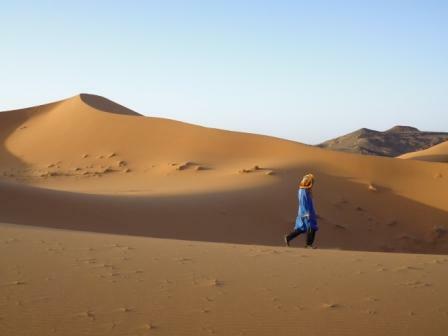 Indeed, very punctual, the guide, a Berber, was waiting for me at that corner, accompanied me to leave the car in a safe parking and then we went to Merzouga, which is located in the middle of the desert, with the idea of ​​the next day to begin the tour to Erg Chebbi. At that moment an incredible adventure began in the desert. 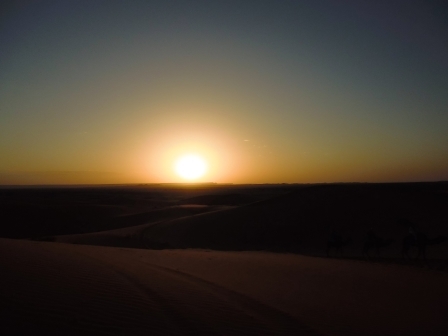 My arrival to Merzouga was incredible, I could not believe that I saw this incredible landscape. The hotel was literally in the middle of the desert dunes, the view was amazing. Most unbelievable, it was definitely lying down looking at the starry sky on a dune near the hotel at night. It is something that definitely I recommend you do. 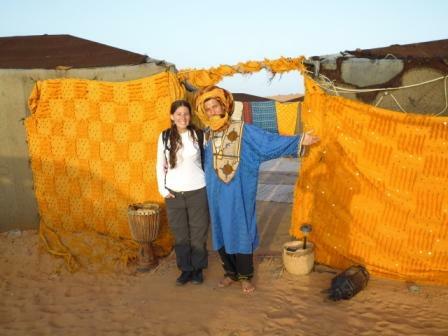 The following day I went to the middle of the dunes by Camel to the Berber tents to spend the night. This tour was amazing. 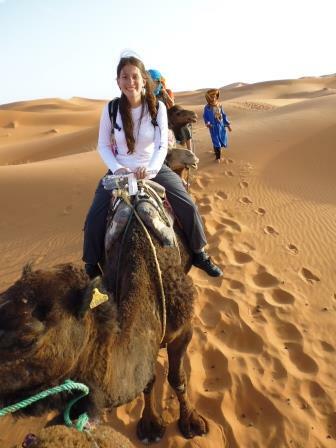 I rode in dromedary just over an hour to enter the world of the desert. Everything was prepared for the tourists, the facilities, the food (dinner) and the attention is excellent. I remember that before planning my trip, I was finding out a lot about where in the desert it suited me to spend a few days. The options I found were Erg Chebbi and Erg Chegaga. 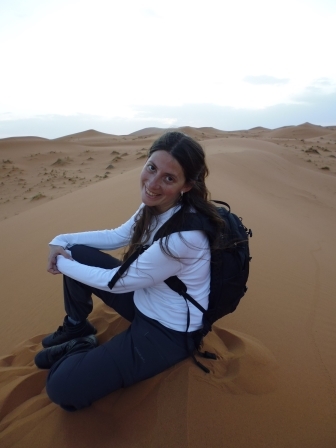 One of the main reasons that gave me a certain preference was that Erg Chebbi was on my way to travel around Morocco, but that would not be what determined the choice of dunes to visit. 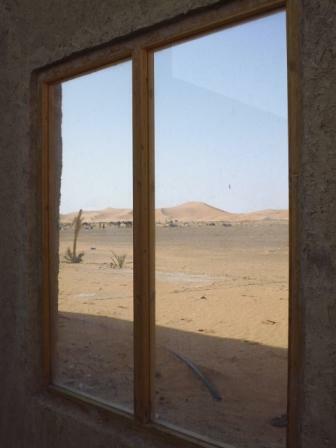 In several forums that I entered, it was stated that Erg Chebbi was the largest dune in the country and that Erg Chegaga was a young destination not very prepared for the tourist and according to what he had read to reach Erg Chegaga from the nearest town took 3 Hs off-road and the road was somewhat dangerous. 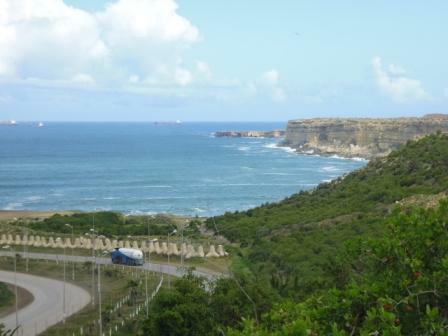 Erg Chegaga is close to the Algerian border. 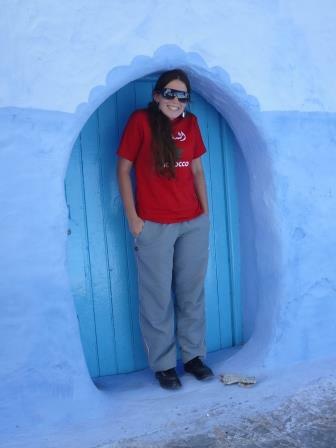 So, according to the experience of some friends of mine who had gone before, made that the decision to go to Erg Chebbi. 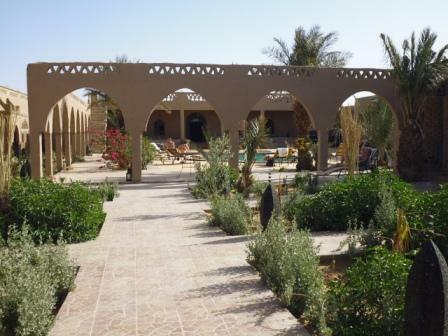 The next day, I returned again through the desert by Camel, and then I enjoyed the pool of the hotel, which after so hot a dip was the best option. The next day I went to Merzouga’s souk with the guide and then I went to part of the original route that was done in the Paris-Dakar Rally in 4×4. That day, the guide invited me to eat at his house with his family since we had generated a good relationship and confidence, so the next day I went to have lunch with his family. 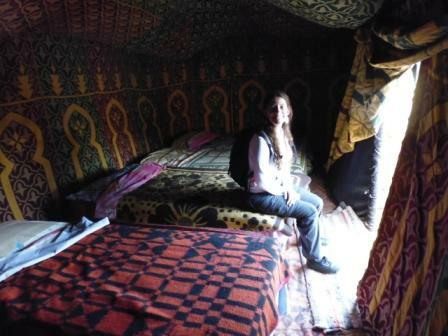 It was great, as it was in the middle of a house with typical Berber customs. Mom had cooked cucus with chicken (traditional Moroccan dish) which really was exquisite. The whole family was very loving. 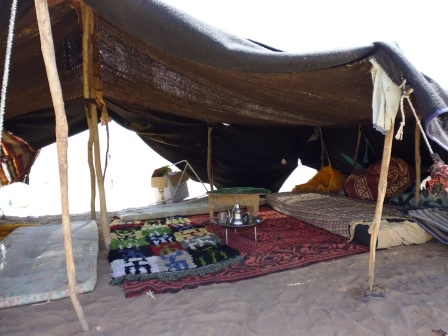 After lunch, the guide took me to take a good mint tea (traditional Moroccan infusion) to a Berber tent with a family that lived according to Berber ancestral customs. Finally, we went to the gardens of Merzourga that remain in the middle of the desert. 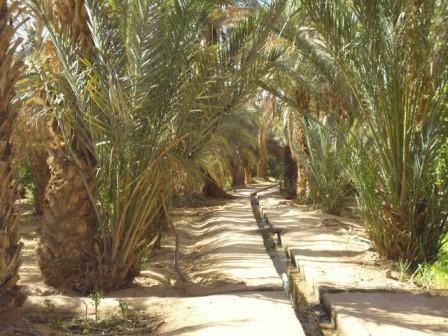 These gardens are watered by a set of canals made by the Berbers as you can see in the picture below. It’s incredible to see those gardens in the middle of the desert. From what I was told that day, every family has a plot where they can cultivate whatever they consider. The water is diverted from channel to channel to ensure irrigation to all plots using small mounds of sand that are manually placed. The previous night I went to get my car to make sure I got out early in the morning to Fez, one of the imperial cities. The trip lasted more than 8 hours (if you go without stopping it is planned to be in 7 hours) going through incredible places and stopping at several of them. 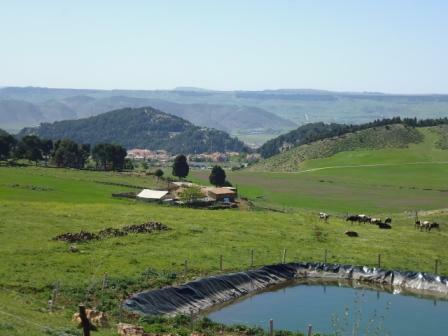 On the route I passed by a beautiful city called Ifrane or Ifran that is located in the Middle Atlas and is capital of the homonymous province. It is situated in a mountainous area at 1,713 meters altitude and has a cold climate, which has made Ifrane a great tourist destination for Moroccan families mainly of good economic standing, who go there to ski and practice other winter sports. 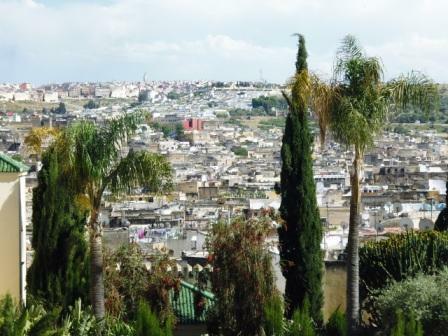 Fez is the third most populous city in Morocco. 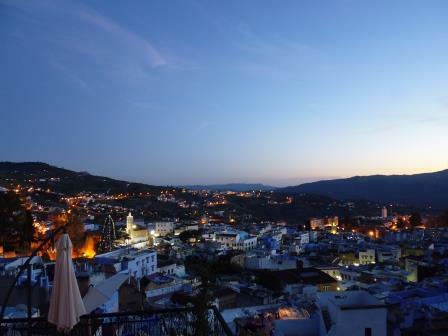 The city of Fez is the capital of Islam in Morocco. 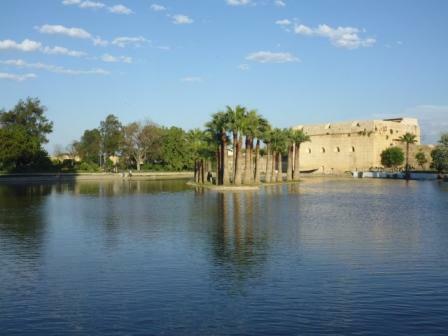 It is one of the four so-called imperial cities among with Marrakech, Meknes and Rabat. 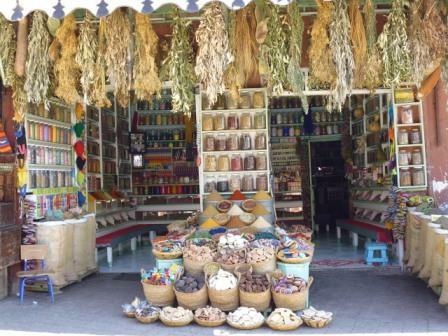 In Morocco it is considered as the religious and cultural center of the country. The city is divided into three zones, Fès el-Bali (ancient area within the walls), Fès el-Jdid (new area, where the Mellah, Jewish quarter) and Ville Nouvelle (New Town), the French zone in the northwest of the city. 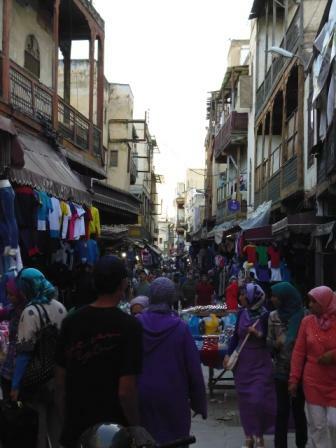 The medina of Fez el-Bali, the largest of the two in the city, is the largest pedestrian zone in the world, and was declared a World Heritage Site by Unesco in 1981. Fez is one of the immemorial imperial cities, perhaps it is one of the most important symbols of Morocco. 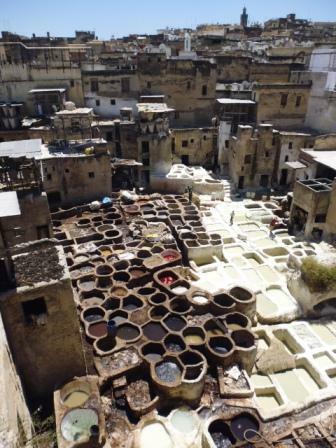 The medina of Fez el-Bali along with its labyrinthine streets where it is very easy to get lost is one of the largest medieval sites in the world today. When I was there I felt that I was transported in time. The magic of that city is unique. 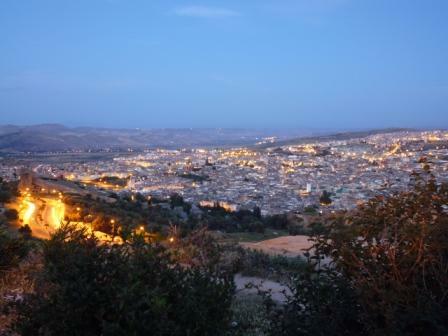 A unique spectacle is to go at dusk to Borj-Nord which is elevated to the outskirts of the medina. To see how the medina begins to light is an indescribable spectacle. 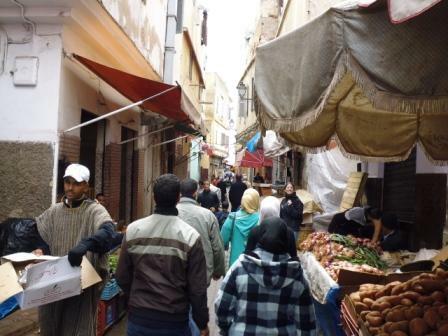 In addition to the typical souks, I was touring the souks most visited by locals to get to know the essence of the place. I also took advantage of going to have tea at the Sofitel which has an amazing view of the medina. 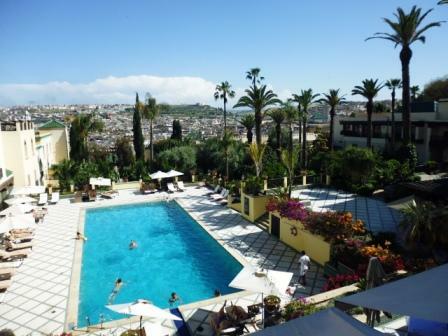 The hotel is indescribable, they are all very well maintained details and the staff is excellent. The journey to this incredible city takes more or less 4 hours. The Spanish influence on it and the characteristic blue color that literally floods the medina gives it a beauty like no other medina. 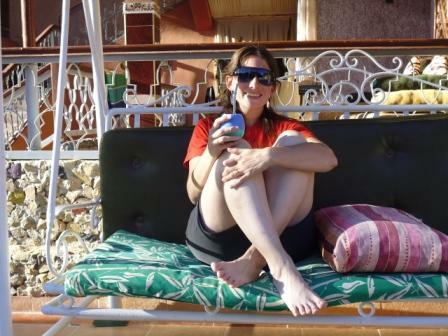 When I was there I stopped at a Riad whose owner was Argentine. The attention and quality were the best. If you want to go to a hamman, you have the option of going to a public place or inside some hotels. 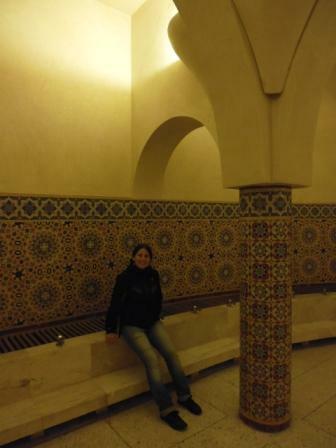 A visit to a Moroccan hammam (public bath) is a wonderful experience and one of the best ways to connect with Moroccans. The basic rules for bathing in a hammam are not written in stone, but here is a guide to the traditional way of doing it. 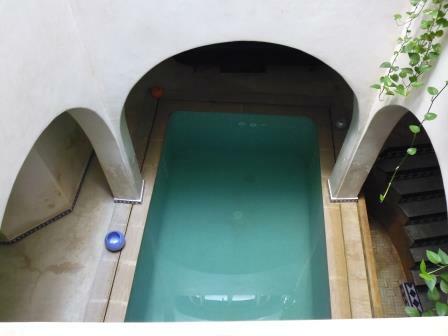 It is called Moroccan hammam to a service of aesthetic corporal typical of Morocco. There are Hammams for both men and women. Its origin comes from the Roman thermal waters that extended along and to the width. 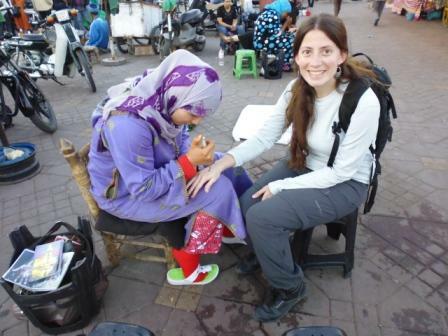 In Moroccan culture, it also serves as a meeting point for women from the same area or neighborhood. It basically consists of a woman (in the case of women) who generously applies a black or beldi soap, directly on the skin, made of olive oil, leaving it to act for about 10 minutes, preparing the skin for an intense exfoliation with a black glove named the kassa. For me it was super relaxing and a comforting experience. 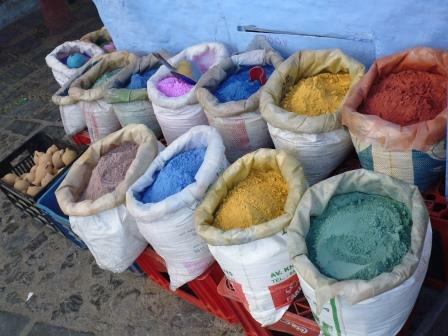 This is a must do in Morocco. 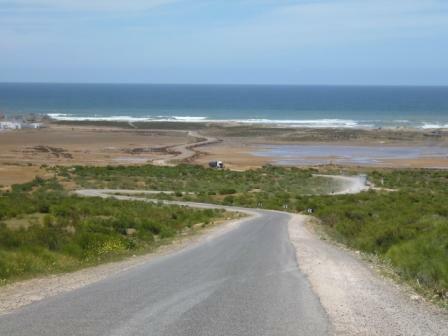 The following day, I drove to Tangier and took the plane to continue my tour in Spain. 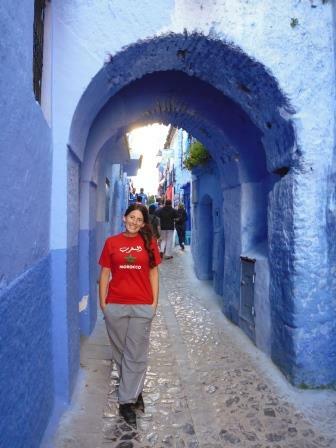 Where to stay in Morocco? 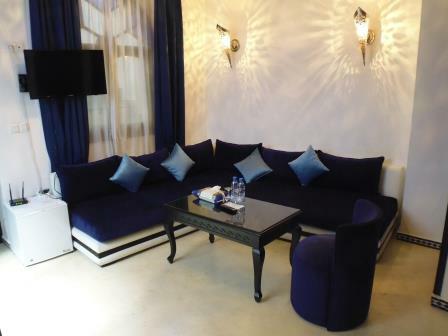 My experience at Riad Mille et une Nuits was excellent. 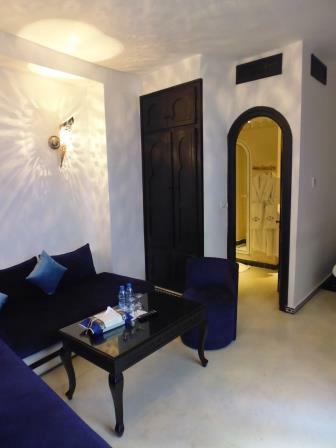 Excellent location, outside the medina but close enough (a couple of blocks) to be able to leave the car near the riad and be able to walk to the medina without any problem. The quality of the rooms and the staff was excellent. 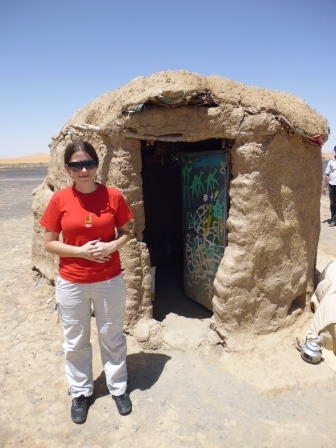 Where to stay in Erg Chebbi? My experience at the Nomad Palace Hotel was excellent. Excellent location in the middle of the dunes. As I showed before from the terrace you can see the pool surrounded by the dunes. The quality of the rooms and the staff was excellent. 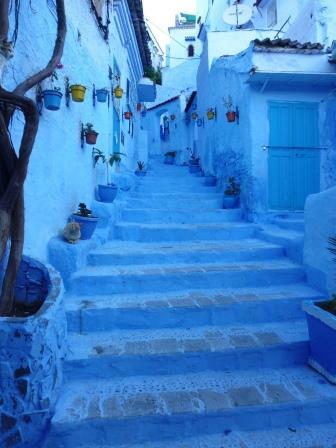 Where to stay in Chefchaouen (Chauen)? My experience at the Lina Ryad-Spa was excellent. 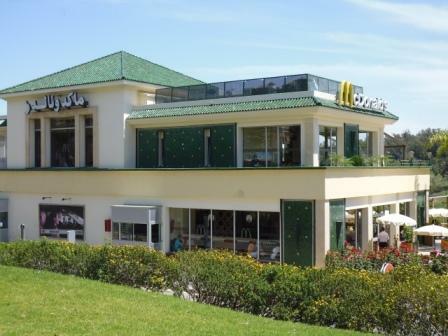 Excellent location, within the medina. 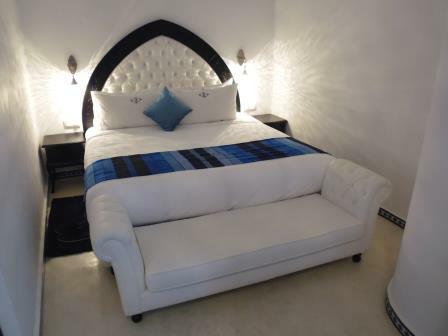 The quality of the rooms, facilities, hammam and staff was excellent. In general terms, if you are with car, it is advisable to stay outside the medina since in the medina you can not enter the cars. 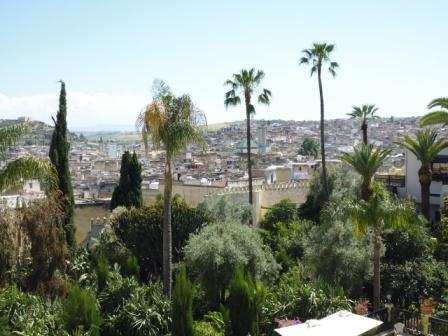 Similarly, in places such as Fez, you can leave the car very close and stay in the medina. Respect the maximum speeds allowed and if there is no signage, every time you pass through a town reduce the speed equal. 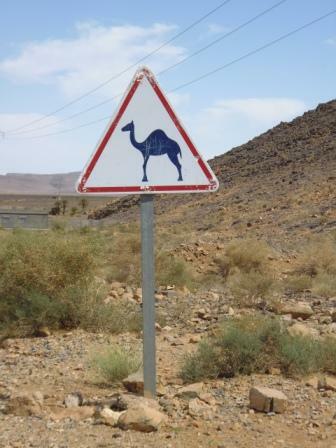 It is advisable to carry Moroccan money since to be a tourist it is very probable not to realize some speed limit and there are effective in most points ready to charge a fine for speeding. Do not photograph people without asking permission or photographing paintings where the eyes are seen. I have seen vendors who have rebuked tourists for doing that. In some towns they even consider photography blasphemous. In the markets, it is customary to haggle. Go with comfortable footwear and make it easy to take out to enter the mosques. Dress appropriately according to the custom. Overall both some friends of mine and I, who have traveled women alone have not had any problems for the places where I was. It is advisable, to avoid many glances and not feel uncomfortable, that women dress discreetly and appropriately according to the custom, if they see my dress was not very flashy or low-cut. It is a place where scorpions can be found, so be careful of the rocks as they are usually hidden under rocks and potentially in shoes and sleeping bags (mainly for those who go camping) so it is useful to shake them before putting them on. If you camp, buy or collect firewood (do not cut it) and use it sparingly for being a scarce commodity. Do not drink alcohol in the villages of the interior and in many remote villages consider it offensive. Visitors from most Latin American countries, such as Argentina and Brazil do not require a visa, as well as those from most European countries, Oceania, North America and Asia do not require a visa if they travel by 3 months or less. 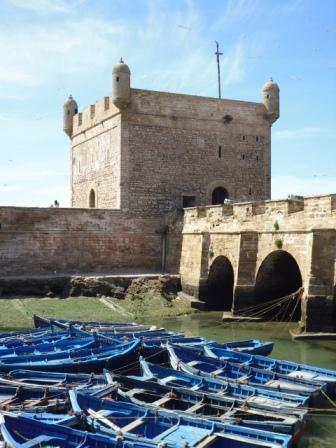 In the next page https://morocco.visahq.com You can see if you require a visa and the requirements to be fulfilled for entering the country. I recommend you before traveling check back again whether or not you require a tourist visa. 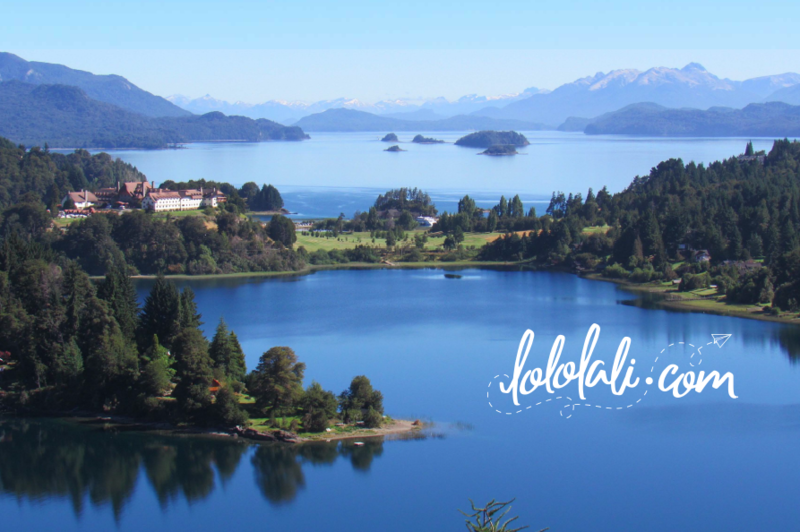 If anyone wants more data do not hesitate to contact us at info@lololali.com. If you want to leave your comments and experiences in the blog are more than welcome!